This booking system is brand new to our business. We hope you find the experience to be straightforward and always appreciate feedback. We have introduced this online option for your convenience, but are happy to respond to your questions via email and are available between 9am and 10pm Newfoundland time to take bookings or answer questions directly on the phone. When I enter dates and hit search nothing happens. What does it mean if a property shows $0 when I am trying to book? If a property says Sold Out during a search does that mean it is sold out for all the dates I am looking for? How do I book multiple rooms or houses, switch accommodations during my stay, or add a reservation for the Twine Loft? Once I have completed the booking form and provided a deposit, is my booking official? What if I am not 100% sure how many people will be in my party? Why is the deposit amount requested on the online booking system not the same amount described in the deposit policy? What is the difference between a dinner reservation request and an actual reservation? Why can’t I select the dinner time I want? Why do Twine Loft Dinner reservation and breakfast requests appear when I am filling out my booking form? Don’t forget to select your chosen category. 2. Is there any flexibility for minimum night stays? Some vacation homes require a minimum night stay, however, we may be willing to rent them for a shorter amount of time if less than the minimum is available between existing bookings or if the booking does not disrupt a larger block of availability and there are no other options for your party. Please contact us directly if you wish to inquire about this option. 3. What does it mean if a property shows $0? In order to take the occasional booking out of season or start taking requests for next year, we have left certain rooms and houses open so that requests can be submitted. If $0 is showing it means that we need to review the request first and will be responding to you as soon as possible to let you know if your request is possible and what the price will be. 4. If a property says Sold Out during a search does that mean it is sold out for all the dates I am looking for? Not necessarily. If any of the dates you request are not available, the specific room or house will show as sold out. 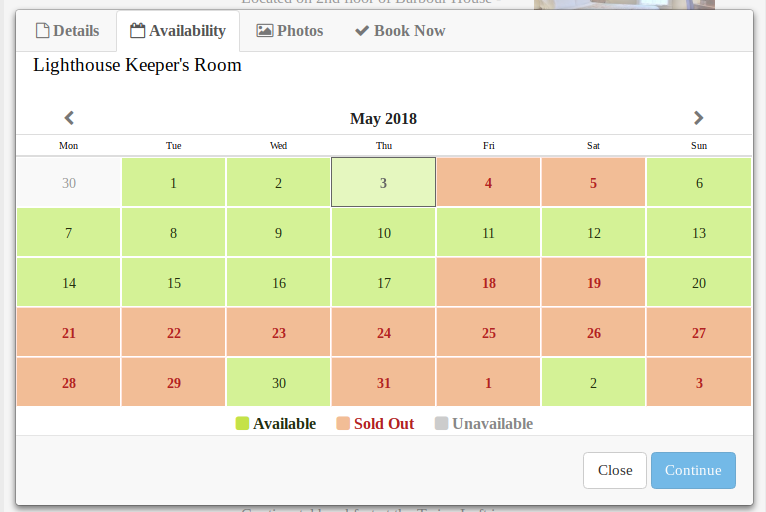 For example (please see pictures below) if you request May 1-5 2018 for Lighthouse Keeper’s Room it will show as sold out, even though May 1,2 and 3 are available. If your dates are at all flexible, or you do not mind switching spaces, we recommend that you select the property or room you are interested in (even if it says sold out) and click the Availability button below the SOLD OUT and Details on the left side of the listing. This will show you an individual calendar for that property. 5.How do I book multiple rooms or houses, switch accommodations during my stay, or add a reservation for the Twine Loft? If you wish to book multiple rooms or houses, add dinner reservations, or switch rooms or houses during your stay, select the first item you wish to book then before filling out your information select Add to Booking found in the upper left corner. 6. Once I have completed the booking form and provided a deposit, is my booking official? In general yes, however, please understand that this is a brand new system and we predict that there may be some kinks we need to iron out. If there are any issues with your booking, we will contact you immediately. We recommend that guests read and understand our policies to see if their reservation is appropriate for our establishment. Many of the properties we own are managed by us and owned by other people. If we do not feel that your group (depending on size, age of guests, intentions of use) is not appropriate for that space, we reserve the right to decline the booking and refund the deposit. 7. What if I am not 100% sure how many people will be in my party? The price of the accommodation can often fluctuate depending on how many people are in the party. We suggest you enter the number of guests you think will be in your party and we can always adjust it once your plans change (so long at it does not exceed the max number). Please be advised that guests of our vacation homes must register at the Twine Loft and a staff member will personally take them to the vacation home. Trinity is a small village and the manager, owner, and various staff members live throughout the village, so sneaking additional people into the vacation home is not something that goes unnoticed. Guests renting multiple vacation homes still need to respect the max number of guests allowed in each individual house at a given time. The following Topic applies to bookings of 5 nights or longer or shoulder season bookings. 9. Why is the deposit amount requested on the online booking system not the same amount described in the deposit policy? We have recently introduced an online payment gateway to our reservation system. Unfortunately, we are only able to set the deposits for each room and house at a set amount, this amount is the first-night stay rate during peak season (June – September). This does cause some issue for both shoulder season bookings when rates are lower and bookings of 5 nights or longer when the deposit required is higher. If our following solutions do not work for you, we suggest you book with us directly via email or phone since we can override the deposit amount from our end. If you are booking multiple nights in the shoulder season, when nightly rates are lower, your deposit will still be based on the first-night stay rate during the regular season. If you are only booking for a 1 night stay this will make no difference and the system will never charge you more than the total night stay. EX: If you booked a room in the shoulder season for 2 nights that is $100 instead of the regular rate $150 per night, your total bill will be $200 and the deposit requested in our system will be $150. If you book a 1-night stay at $100 the system will charge you for the total amount $100. Do not be concerned that you will be charged higher than your total bill, this cannot happen. In the event of a cancellation: If you paid higher than the necessary deposit, we will only apply cancellations fees to that season’s first-night stay rate and return the surplus paid on the deposit in full. If you do not wish to pay the higher deposit rate upfront we suggest that you contact us directly via email or telephone to make the reservation as we can override the requested deposit amount. Because we operate in such a limited tourist season, it can be risky for our business to block a property for an extended stay without an adequate deposit. If you are renting a Vacation Home or Room for 5 days or longer the 1st night stay deposit set in our system will not be enough to guarentee the booking. We will create a secondary deposit charge through our Stripe Payment system to make up the difference for the required 25% deposit. The Stripe System captures a customer’s credit card details without showing the number to anyone on our administration team, so you can rest assured that your credit card details are safe and secure. Ex: you reserve a house for $250 a night for 8 nights ($2000), however, the deposit amount is set for $300 because this is the 1-night regular season rate. The Checkfront program will process the $300, which is only 15% of the $2000 total owed. Our administrator will create a second charge to be applied to the credit card you supplied for the extra 10%, $200. This will happen within a day or 2 of your initial booking. You will be notified if and when an additional charge goes through and it will reflect on your invoice. Should you have a question or concern regarding this process, or wish to pay the full 25% deposit all at once, we suggest calling or emailing us directly instead of using our online booking system. If the amount provided through Checkfront is close to 25% we may choose to leave it as it is. 1. What is the difference between a dinner reservation request and an actual reservation? The number of guests we can accommodate in our dining room is dependant on the sizes of the various bookings we have each night. For this reason, you can only make a reservation request on our system, not a confirmed booking, so we are able to first confirm that your reservation will fit. We have chosen not to block off settings that are already full because this would also prevent you from expressing interested in being put on the waitlist for a particular date or time. Because of changing travel plans we often do have to call one or 2 sets of guests on our waitlist. If we have all your details ahead of time from the request form you filled out, it means that we can accommodate any special requirements even if we are finding out that we have space for you at the last minute. Your request will not be official until we switch your invoice from saying “dinner reservation request” to “dinner reservation” and the item dinner confirmation is added to the invoice. You will receive a communication from us and if we are full we can offer you a position on the waitlist. 2. Why can’t I select the dinner time I want? The Twine Loft offers 2 dinner sittings from June through September at 5:30 and the other at 7:45. During May and October there is only one dinner sitting at 7pm. If you cannot select a time to make a request, it is because that particular time is not available during that month. 3. Why do Twine Loft Dinner reservation and breakfast requests appear when I am filling out my booking form? Dinner reservation requests and breakfast reservation requests (the latter is on vacation home bookings only) are appearing as an optional add-on if you see the plus symbol to the left of the item. If you do not select it, specify a date, time and number of people, it will not be added to your reservation. Only the things that you have actually reserved will show up on the reservation document you will see when you enter into the payment page. If you do opt to include this in your reservation the plus symbol will change into a pencil. If you notice the dinner reservation or breakfast add-on option show up multiple times, it is because you are booking more than one room or vacation home and the system is set to add the option per item. If you are a group staying in multiple houses who wish to be at the same table for a meal please only add one of the reservation requests and fill out the appropriate number for the reservation. If you wish to book meals for multiple days you can add extra days by selecting +Add to Booking on the top right. In this example, a group is booking our 2 vacation homes From May 11-13th with 4 guests each. They have opted to reserve dinner for the second night they are staying, the 12th (you can see the pencil is next to the first dinner reservation request and to the far right it no longer says “not requested) and have requested a table of 8 so we know they want to be together. They have decided not to reserve breakfast. Anything with a + symbol next to it will not appear in the final payment window. I want to speak to someone from the inn to make a reservation. We have provided this booking engine for your convenience, however, we are always here to assist guests with their bookings or questions about the area. If you are not sure which accommodation will suit you best we can often advise after asking you a few questions.